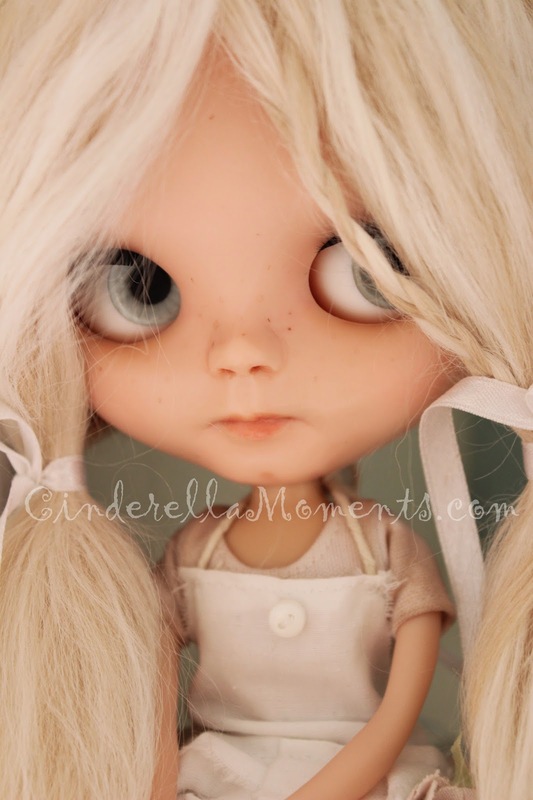 I finished my 4th Blythe Doll. Her name is Brinlie. 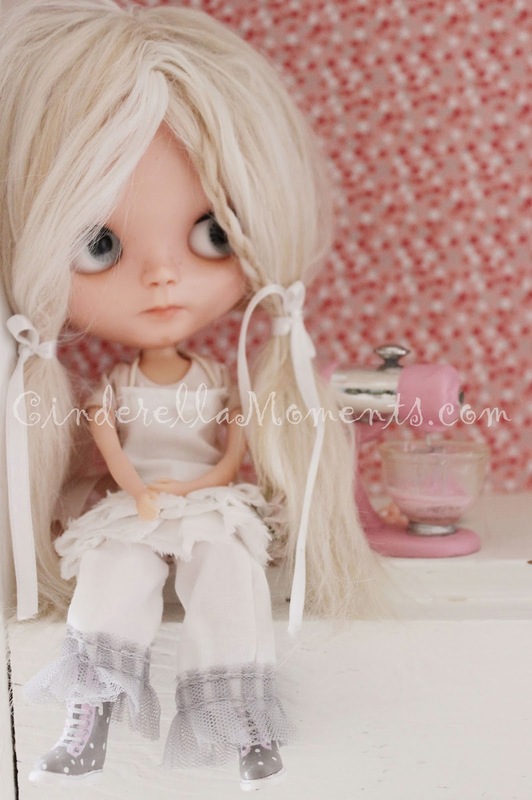 Blythe dolls were originally made in the 70s. 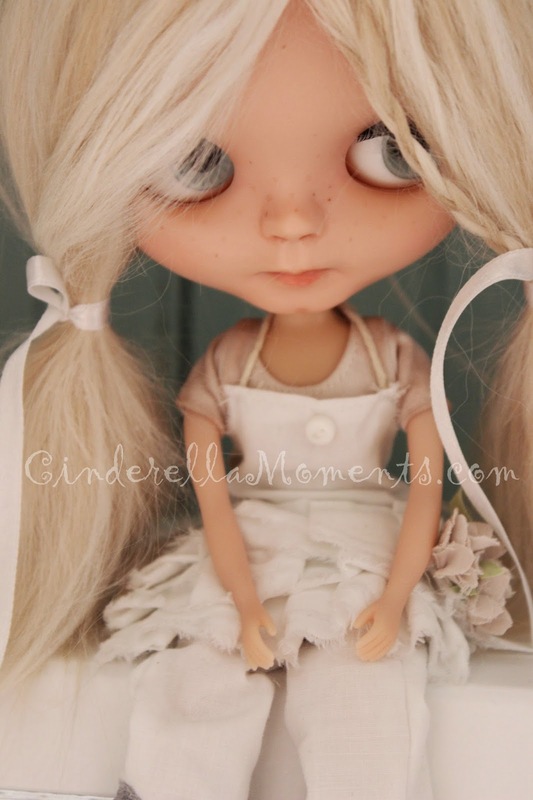 These 12 inch dolls have a string in the back of the head to change their eyes to 4 different colors. I sanded her face and backplate. I carved her lips, nose, noseholes, phyltrum, chin and the area above her lips. 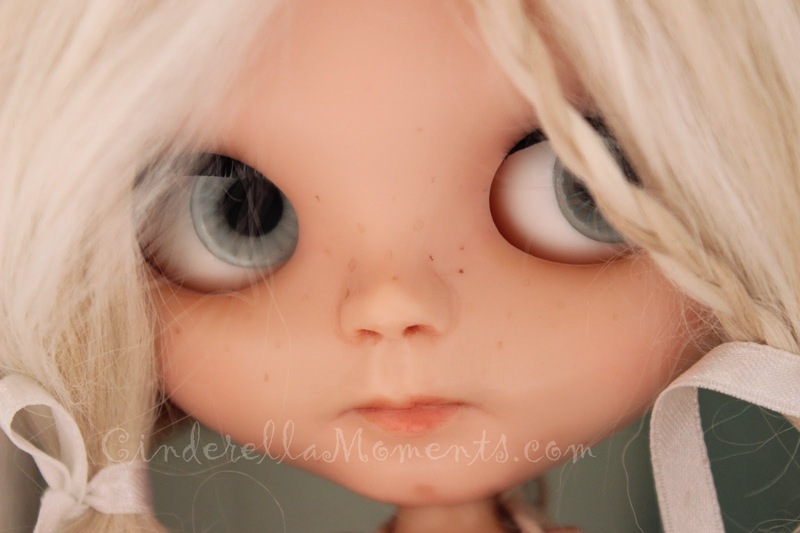 I did a faceup with new lip color, freckles, color around the eyes, blush. 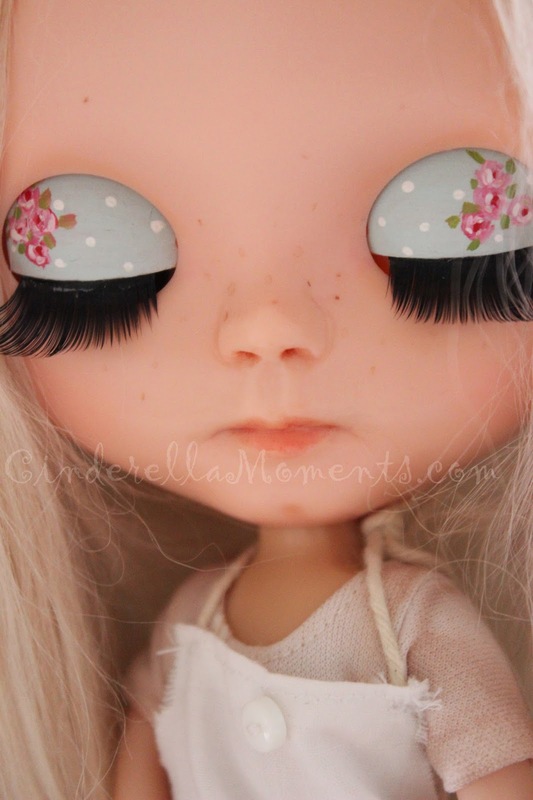 She got new eyelashes and I painted her eyelids blue with roses. 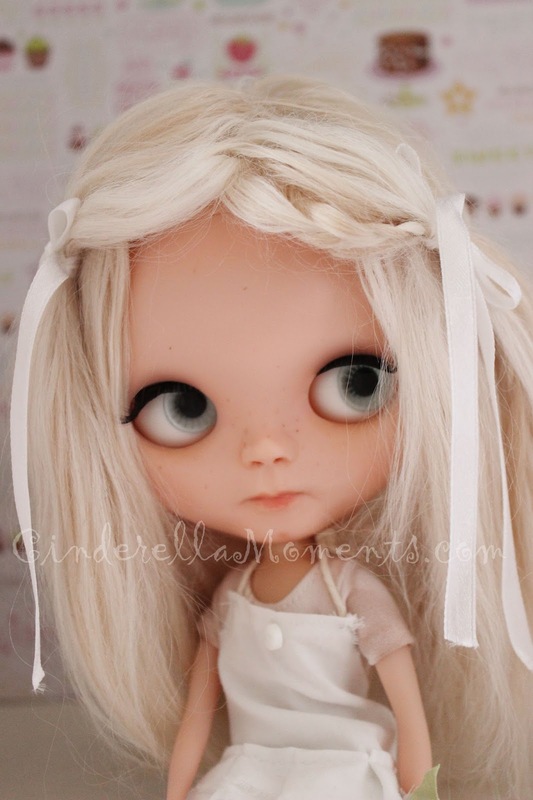 I added a pull cord and charm to make her sleepy eyes, corrected her gaze, and boggled the eyes. She has a pink mixer with pink icing in the bowl. I made the pants and apron. I had these boots. They were hot pink to begin. I painted them to have a more shabby chic look. Her body is a Licca body. The legs bend and are pose-able. And the arms are really flexible. Her pink mixer has a bowl filled with pink icing. She has long blonde Alpaca hair. This hair comes from Princess, a Grand Champion Alpaca. I got it from ShangriLaRanch on Etsy. Thanks for coming over and visiting with Brinlie! 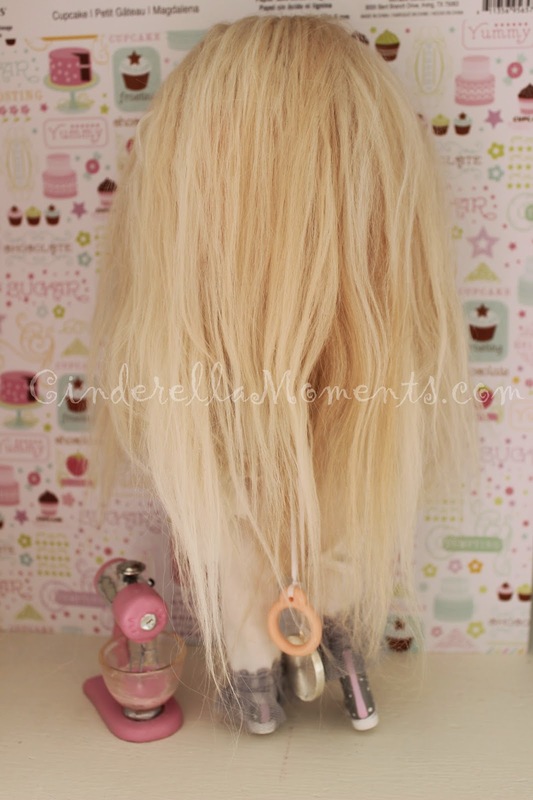 You have customized the doll very successfully! 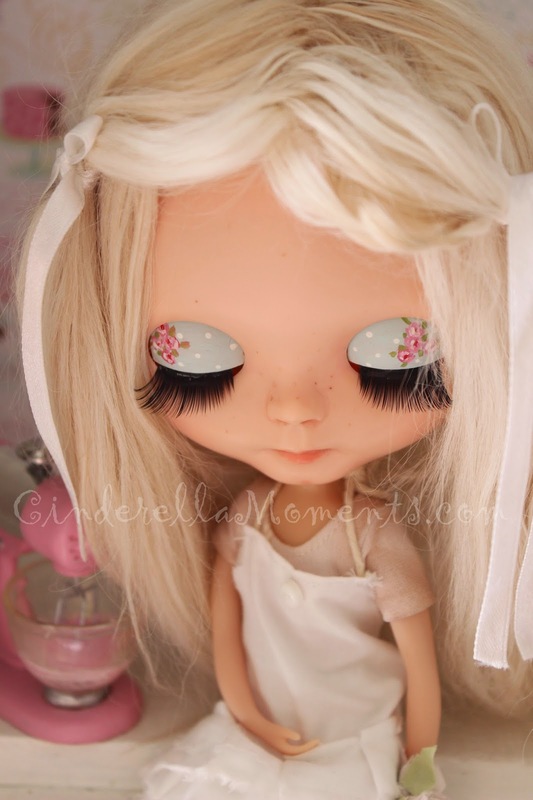 She is absolutely beautiful <3 I like the way you have painted the eye lids! Wow!!! 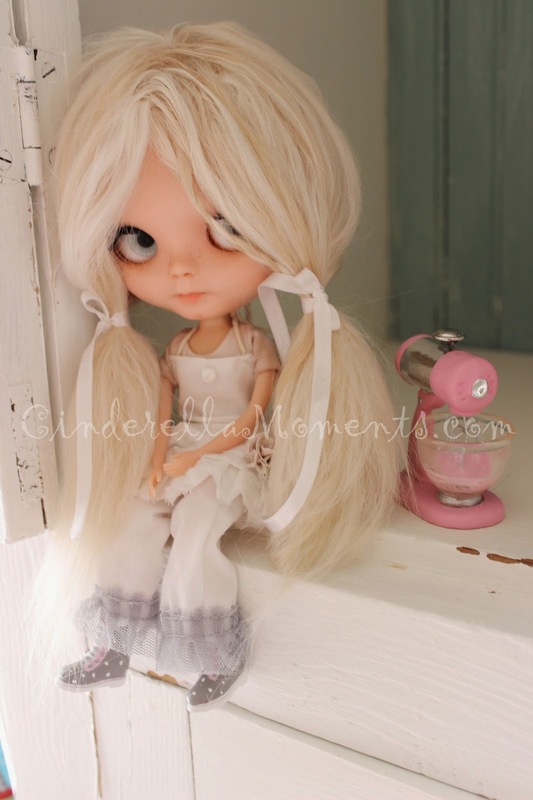 I think this is my favourite doll so far! I LOVE the expression on her face! and the eyelids, and the clothes and shoes looks great too!! And the hair is lovely. She is adorable! You created a new eyelid fashion, pretty soon we'll see teenagers make up their eyes like this. A gorgeous girl and I like how you dressed her. Another amazing creation caroline! I must say she looks so ethereal! So beautiful, wonderful work! Your dolls have each an own personality and with these typical characteristics these dolls belong to a new brand: namely the new "Caroline" brand ;)! She looks wonderful, I really love the painted eyelids......I agree with Drora, soon we will see it everywhere ;)! Nice work! Hi Caroline! 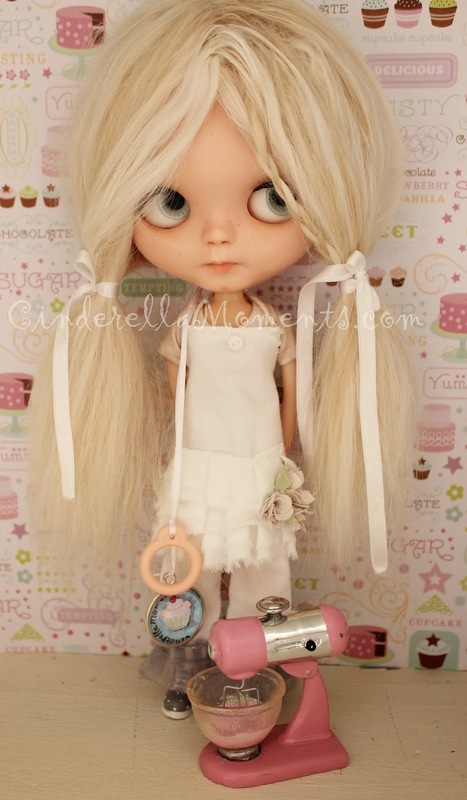 Every time you show us a new Blythe, I think to myself, " This one is the BEST!!!!" That is how I am feeling right now about Brinlie. I think that she is packed with personality and emotion. She looks quiet but her eyes and the shape of her mouth speak to the viewer! Your styling of her hair, clothes and makeup are Superb, and I am simply bowled over by what you have done. What an AWESOME TALENT you have. 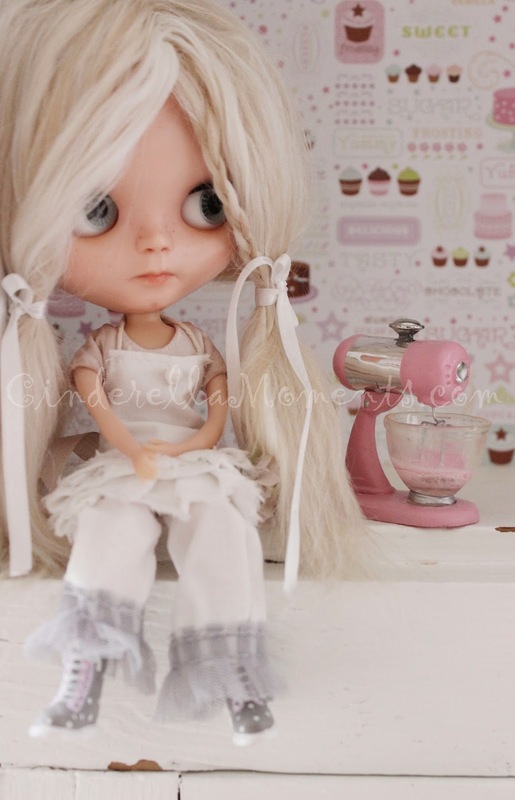 Hi Caroline, you Blythe doll looks soo adorable, I love her hair and her lovely clothes ! 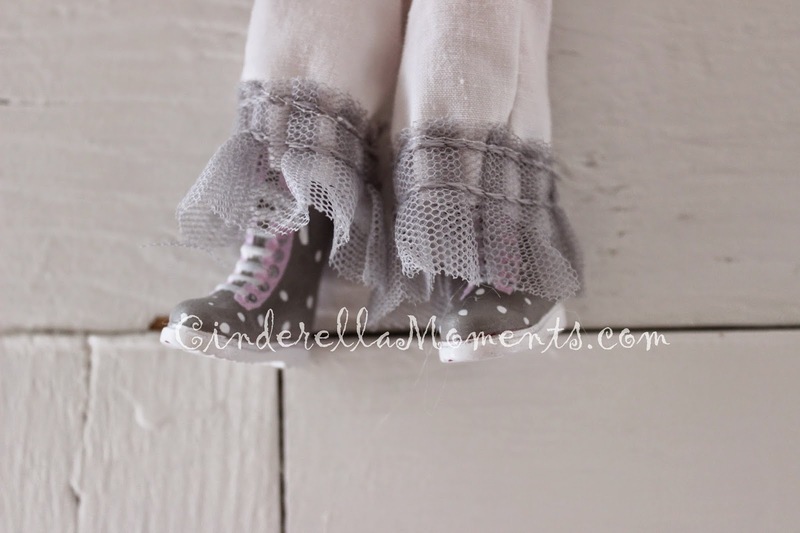 Brinlie es realmente una adorable muñeca,tu transformación ha sido maravillosa,tanto en su cara como toda su vestimenta,las botas me encantan.Tu mamá tiene razón,tiene cara de traviesa!!!! 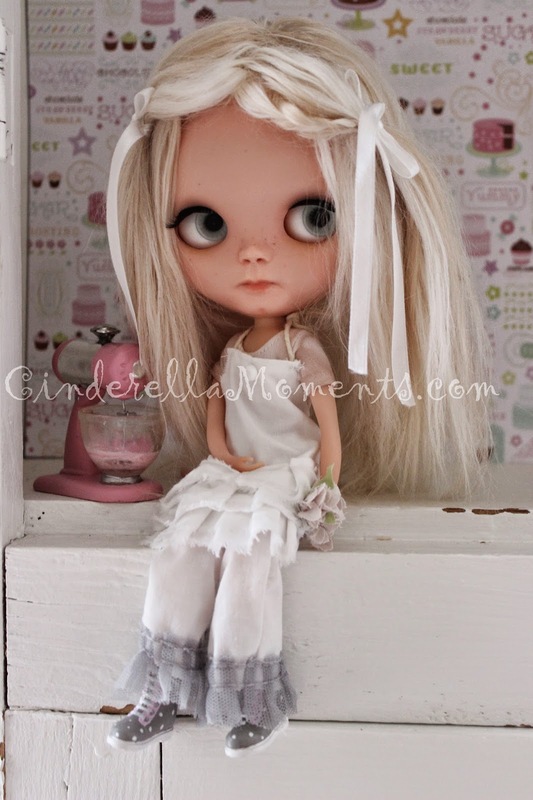 You created a new fashion doll, so lovely customized, Caroline! I like her eyelids too! 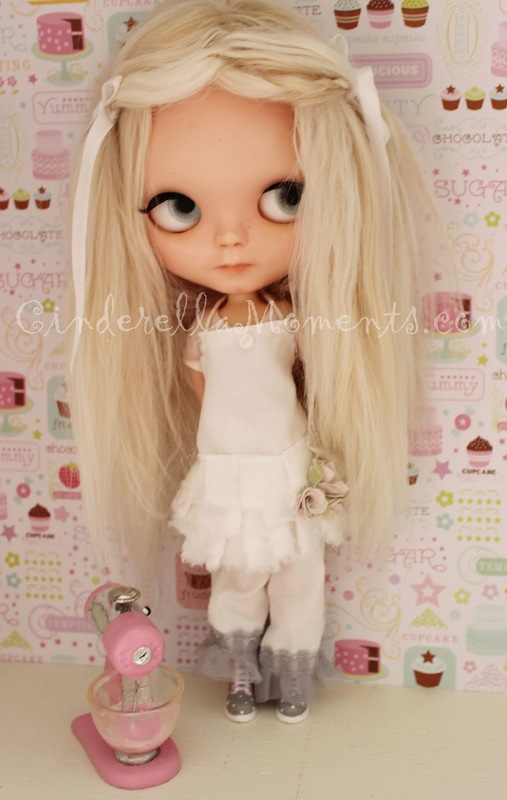 I like the new look of your doll, dear Caroline! She looks very pretty, and I Like her eyelids too!!! She's so cute. I like her eyes. Me encanta es tan dulce. Brinlie is so cute !!! I love her hair, it's so nice !! 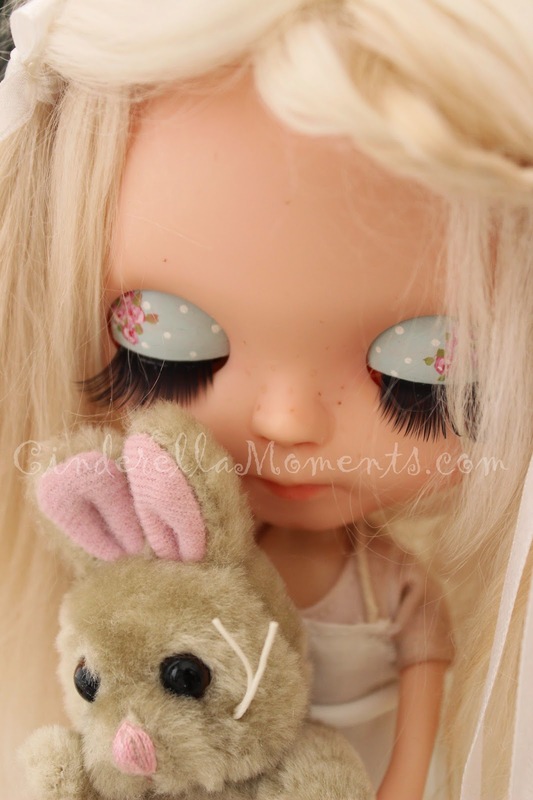 I love Blythe dolls, I've got two ! Caroline, she's a beauty and I love everything you have done to her! You are so talented! You never cease to amaze with your imagination! Great job Caroline! She is wonderful...I love her lips and her nose! She is adorable Caroline! Love the outfit. I bet you have so much fun designing and creating those outfits! :) The ruffle trim is just precious. 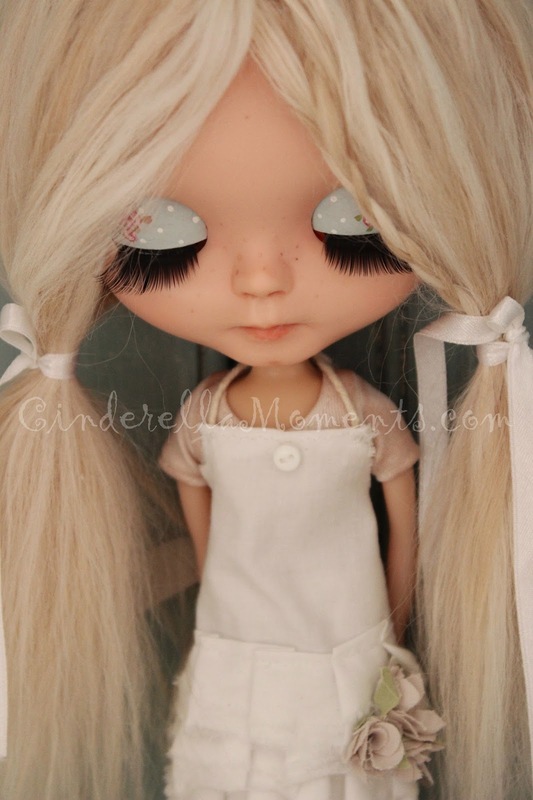 Your Blythe doll is just gorgeous. I'm so happy you are customising them now with the same feel you give to your cottages.....They are simply wonderful! !